it's something of a coup for thewashingmachinepost to receive such an illustrious pair of wheels for review, and i take my campagnolo cap off to david bergmann and stefan behrens of carbonsports for making this happen. 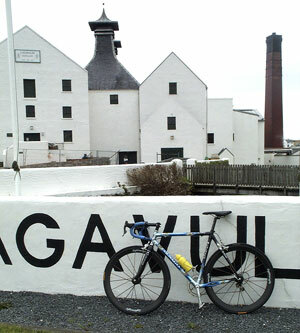 not having great experience with gluing tubs on to rims (let alone such expensive rims), david bergmann undertook to send the wheels to one of their partner companies to have a fresh pair of lightweight branded continental competition tubulars installed prior to despatching to islay. these are available to buy from the carbonsports website for around £40. so basically, what are lightweight wheels, and why should you be interested? as you can see from the photograph to the right, the lightweights are constructed with a deep carbon fibre rim which is suitable for tubular tyres only. rumour has it that carbonsports are working on rims that will accept clinchers, but for now, the tub is the only option. if you look closely, you will see that the hub flange is also carbon fibre, as is, superficially at least, the hub body. however, the hubs are manufactured by dt swiss and are hugi 240s with (very) smooth cartridge bearings. this should make for relatively easy maintenance, though i did not have cause to find out. dt swiss list these as their top end hubs. carbonsports also infer that changing the rear wheel to suit campagnolo or shimano is a fairly simple process by means of an easily removable freehub body. the test pair came set for campagnolo, (as requested), and again, i had no reason to test their claim, not least of which was due to the lack of a shimano freehub body with which to try. the wheels which normally reside on the colnago are built on a pair of pre-2000 campagnolo record hubs, which use a smaller diameter lockring than campag's current offerings, which was not something i had in mind at the time of fitting. so when the eleven sprocket was in place, it was something of a disappointment to discover that the lockring had absolutely no chance of holding all in place. by sheer luck, thewashingmachinepost bike shed had a pristine lockring secured in a small plastic drawer, so the world was saved, but it may be something to bear in mind if you have just taken delivery of these reassuringly expensive wheels (i am reliably informed that there are no such compatibility problems with shimano hubs). the second, and to be honest, the trickiest part of fitting a pair of lightweights to a bicycle came when changing the brake shoes. 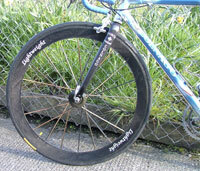 carbon rims do not conduct heat, at least not in the way that we have become used to with alloy rims. so it is necessary to change the brake shoes on the bike to a set that work on carbon rims. for this i was prepared, and had ordered in a set of appropriate campagnolo shoes (they sell them for their bora and hyperon wheels), but carbonsports had thoughtfully included a lightweight branded set with the wheels, so i fitted those instead. getting the old ones out involved placing the holder in a vice and tapping (i use the word advisedly - some of the little blighters were none too keen on shifting) the standard shoe out with a rubber mallet. once it moved slightly, a drop of spray lube into the pad holder helped. the 'specialness' of these wheels does not, however, stop with the hubs. if you can scan your eyes over the photo above left, you may be able to notice that the spokes are not quite in the same ballpark as those prongs of stainless steel to which we all bear homage. and this is because they are not stainless steel, but kevlar. for the uninitiated, kevlar is a man-made material, currently used in bulletproof vests and, bizarrely enough, in the manufacture of pipe band drum heads. in the construction of both the lightweights and drum heads, kevlar's suitability relies on the fact that it can be placed under considerable tension without undue stretching. this factor allows carbonsports to place considerably more tension on the 'spokes' than would be the case with regular spokes and also allows them to be bonded into the carbon rim and sandwiched between the two pieces of carbon that form each hub flange. if 'pinging' is a good indicator of tension, then the sound of the spokes on these wheels resemble the upper reaches of a classical harp. with the combination of carbon rims and kevlar spokes, you can imagine just how strong and rigid these wheels are, but the real selling point, should you need another one, is the weight or almost total lack thereof. 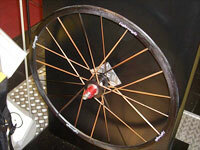 carbon sports offer the front wheel in three different versions - 12 spoke, 16 spoke (the one i had) and 20 spoke. the rear wheel comes with 20 spokes only since there are considerably more forces being applied to the back wheel. these wheels turned up at thewashingmachinepost in a cardboard box, which felt as if it was empty. i'm not sophisticated enough to have scales that measure to the nearest milligram, but to give you an indication of just how light these are, the regular wheel currently removed weighs 1,150g with tyre. the lightweight front wheel weighs 710g (also with tyre). that's pretty much a whole pack of butter of a difference. and because that's rotating weight rather than static, it makes even more of a difference, both to acceleration and pedalling uphill. so assuming the difference to be equal across both wheels, this shaved at least 1kg off the total weight of the colnago. and that's a lot. so how do you measure how fast you're going? well, carbonsports have thought of this too, and laminated into one side of the front rim is a samarium cobalt magnet which weighs so little it doesn't upset the wheel balance one iota. if i were to be super critical, it would be sort of nice to know just exactly what it is you're looking for on the rim, to be able set the computer sensor at the right height and angle. fortunately, the wireless sensor employed by polar has an led that flashes when the magnet passes, so that's how i figured out where the thing was sited. believe it or not, it just looks like a splodge on the carbon, but overcomes the problem of how the heck i was ever going to fix a magnet to a kevlar spoke. so, to round off the 'what the heck are they' part of the review, should we be interested? if you're a racer or time-triallist, then almost definitely 'yes'. if you're a recreational cyclist - and by this i mean someone with a 'good' road bike and who would be winning the milan san remo were it not for work, age and watching too much television, then it's a qualified 'maybe'. assuming you have a bank manager who doesn't frighten easily, a bank account with lots of numbers and zeros in the balance, or a credit card with a largish limit, then maybe you should be interested. the cost? well, in the uk they appear to retail for around £1,800, while competitive cyclist in the usa have them on their website for 3,700 dollars. bear in mind that these are the 'standard' lightweight wheels - you can spend a lot more if you like. whether you feel like spending more money on a pair of wheels than some folk spend on a car, is entirely up to you. however, if you're prepared to wait for the road test part of this article, that may help you make up your mind if you're swithering. it's coming very soon. i should mention here that, in an earlier version of this article, i stated that i really didn't like the lettering stencilled on the wheels, which i asserted was a font called zapf chancery. well since originally writing that, i have had cause to reconsider, because i have come to quite like the lettering after all, so much so that i have ordered a lighweight t-shirt, which has that lettering, from carbonsports' website. and then i received an e-mail from stefan behrens pointing out that the font used is, in fact, lucida calligraphy which has attained a degree of cult status due to its association with the wheels. considering i actually studied typography for many a year, i hold my head in shame at confusing the two typefaces. naturally the lettering has no bearing whatsoever on the effectiveness of the wheels, and i am definitely in trivia land with this one. so in honour of the wheels and my incompetence, you will notice that thewashingmachinepost header is now displayed in lucida calligraphy. my name is brian palmer, and i'm a wheelaholic. there, that feels better. and this addiction has been at least partially satisfied by the affixing of the heretofore mentioned lightweight standard wheels to the colnago. i say partially satisfied, because the wheels have to go back to their home in friederichshafen quite soon, and i shall miss them. i have mentioned their somewhat unbelievable lightness in the preceding part of this review, and the fact that they have lightened the colnago by at least 1kg. coincidentally, in the current issue of 'cycling plus' magazine, there is a comparison review of some of the world's other sooper dooper wheels, all of which were heavier than the lightweights currently under consideration - though it should be admitted that all were cheaper. 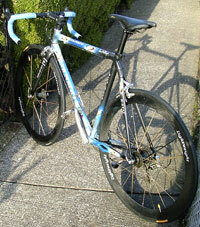 so how did such gossamer wheels fare on an already light bike and under a not very heavy rider? well, i asked carbonsports for a review pair of wheels not only for that reason, but also to find out how the deep rims would handle in the often frightening crosswinds we have on islay (and are, in fact, having as i write this piece) and how comfortable and stable they were likely to be on the rapidly deteriorating roads around certain parts of the island. before i attempt to provide the answers to these questions, it's only fair to share the credit. the lightweights were pre-fitted with continental competition 22mm tubulars, specifically branded for carbonsports and fitted with valve extensions to clear the deep rims. while i would love to give the impression that i am the epitome of the professional cyclist, sadly, that is far from the truth. thewashingmachinepost bike shed does contain an elderly pair of vittoria tubulars, but the valves wouldn't even begin to reach the end of the carbon tunnel that would allow them to use the services of a track pump. so i have put well over 500 kilometres on a pair of wheels with my fingers crossed, because if i punctured it was probably going to be a long walk home. it is very much to their credit that i never had to do so. and wheels are nothing without hubs. the carbon wrapped dtswiss hugi's that centred both front and rear were smooth enough to be almost un-noticeable. in fact, were it not for a more audible than usual ratchet on the freehub, they would have been completely un-noticeable. while hubs feature highly in my wheelaholicness, the smoother they are, so much the better. absolutely nothing happened to the lightweights. they didn't even hint at going out of true - and to be honest, if they had, there's not a darn thing you can do, because the kevlar spokes are bonded into the fabric of the wheel and have no way of being trued. and there's not a mark on them as witness to my extra curricular potholing. the weirdest bit was the stiffness. cycling.tv were kind enough to send me a couple of water bottles a few months back, and i persist in using the yellow one in the titanium cage on the colnago. having been too lazy to adjust the cage to fit the bottle properly, it rattles in the cage when it's full of energy enhancing water. with the lightweights fitted, the bottle rattled even more than before, audibly pointing out that the bike was being subjected to a harsher time than with my regular wheels. the weird bit is that this wasn't filtering through to the rider. and try as i might (and believe me, i really tried) i could not feel any untoward discomfort from a frighteningly rigid pair of wheels. and nothing on the rest of the bike seems to have suffered either. it's perfectly possible that the comfort factor came via the continentals, but i'm not entirely convinced, and not technically adept at sorting out the science. take it from me that fitting a pair of lightweight carbon wheels to your bicycle will not shake the fillings from your teeth. 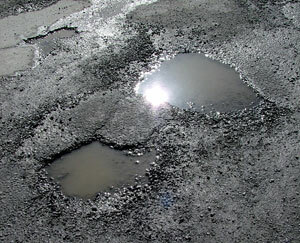 even allowing for the state of some of our roads, these wheels floated. 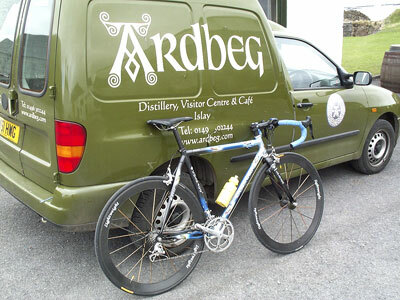 i remember saying to my fellow members of velo club d'ardbeg that i found myself in a real dilemma - these wheels felt really good, but i was having a great deal of difficulty translating this feeling into words that would do them justice. and i'm not at all sure that i have succeeded. in fact i'm almost sure that i haven't. and what about the wind, i hear you ask? well, it's funny you should ask that, because that also blew away some myths (if you'll pardon the pun). coincidentally with the period that i have had the lightweights for test, the wind on islay hasn't let up much at all. in fact, if anything, it has been stronger and more persistent than usual, though it is something of an occupational hazard on these shores. windspeed is pretty much in the 40kph region (we in velo club d'ardbeg look on it as being character building, mainly because if we didn't, we'd probably take up dominoes, tiddly winks or some other indoor occupational therapy) most of the time, even on bright sunny days. into a headwind, the lightweights are quite exceptional. it's not that you suffer less because of their windcheating abilities, you just suffer at a higher speed. however, it's not that often that you can continually pedal into a headwind - at some point round loch indaal, it's going to turn into a crosswind and this is where i thought i was going to get into all sorts of trouble. wrong. obviously there has to be a transition between a head or tailwind where it alters to a crosswind, but this transition was apparently seemless. i say apparently because i remained blissfully unaware of it happening. ok, so when it became a crosswind at these speeds, you could tell, but pretty much only after it happened. and once the crosswind was buffeting the bike and rider, it wasn't anywhere near as difficult as i had imagined or been led to believe. with a constant crosswind, the lightweights were not any harder to control than a standard pair of wheels, despite their larger lateral surface area and incredible lack of grammage (is there such a word, or did i just invent that?). carbonsports now make a pair of carbon wheels with the same style kevlar spokes, but with a more standard profile carbon rim, similar to the campagnolo hyperon. i am ever hopeful that i might persuade stefan to lend me a pair of these (lightweight ventoux) later in the year so that i can compare like with unlike. wheels with the qualities of the lightweight 'standards' but which present less surface area to a crosswind would be sheer unmitigated joy. so, as i stated at the beginning of the test, my name is brian palmer, and i'm a wheelaholic, and these wheels have done absolutely nothing to cure that (despite the conciliatory remarks in my opening statement). these are the most incredible pair of wheels i have ever had the good fortune to ride. they are nothing short of phenomenal. despite the hammering i attempted to give them, and how close i had the brake shoes adjusted, the rims never once scraped the blocks. even standing up, climbing a 14 percent gradient, there was no flex in the rear wheel - no brake rub at all. and that utterly wonderful and singularly exciting sound that a carbon rim makes when you're pedalling ought to be bottled and sold as an essential accessory for any bike. are they worth nearly £2,000? yes, they are. whether you have that kind of money to spend, is a question only you can answer but put it all into perspective. a good quality carbon frame will cost the wrong side of the above mentioned figure and a similar quality groupset could add at least half that. so if your cycling budget is already in the above region it doesn't seem too much of a stretch to consider a pair of lightweights. when time allows, i'm hoping to place a short video of the lightweights as a download (sooner rather than later). i'll let you know when it happens. 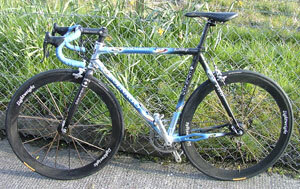 postscript: i have just returned from a brief 20k ride having re-fitted my original wheels to the colnago. the difference is almost palpable. what used to feel like a light, chuck-about-able carbon road bike, felt distinctly leaden through every kilometre with no lightness in its step. i know this will pass along with the kilometres, but right now, i'd like the lightweights back please (though i do have the t-shirt:-). you can download the whole of this review/road test as a pdf document.